University of Rochester Solar Splash is a group of students who are committed to designing, building and racing a solar-powered electric boat. Our group emphasizes learning and practicing engineering skills through hands-on construction and real-world application of theory learned in the classroom. 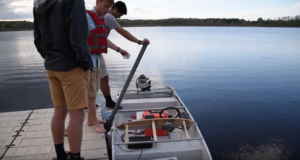 Our goal is to learn a hands-on approach to the hydrodynamics, materials, mechanics, and electronics involved in building an electric boat with the intention of entering the international Solar Splash Competition each year. Through extensive drafting, construction, and testing, we hope to achieve success as a team while also exposing our members to the practical engineering process. This team is completely student-run. Getting involved with Solar Splash is simple – Just come and attend! Our club holds multiple meetings each week, and members should expect an average of 4 hours a week with the club. 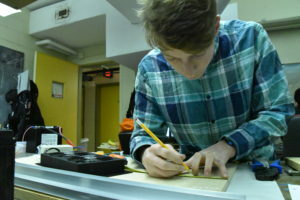 We have training programs and will teach you a range of skills from woodworking to CAD design and simulation. Once you’ve gotten up to speed, join one of our project teams to help contribute and make the boat go faster! To Join Solar Splash, please start by reading our New Member’s Guide, which provides a summary of steps to join the club. All meetings are open to any current students at the University of Rochester who wish to attend.